At last, the first lady of the Gothic makes a long-overdue debut on the blog. 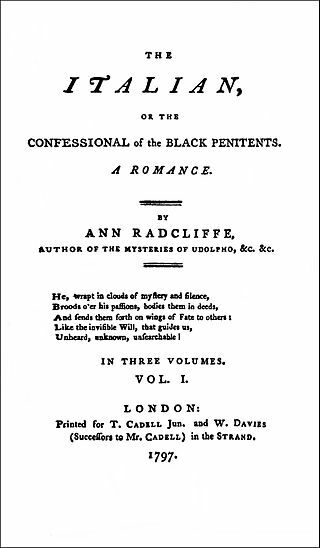 The last of her novels to be published in Ann Radcliffe’s lifetime, The Italian: or the Confessional of the Black Penitents was written in response to Matthew Lewis’s The Monk (1796). Whereas Lewis’s novel employed a panoply of demons, ghosts and gore that bordered on camp, Radcliffe’s more subtle account of the machinations of the evil Father Schedoni puts into practice her preference for terror (the sublime stimulation of the nervousness or anxiety that foreshadows horrific events) over horror (the abject revulsion that inevitably greets the horrific reality of catastrophes and abominations directly observed). Presented in the form of an assassin’s confession, the resultant psychological drama is amongst the best the genre (and Radcliffe) has to offer. 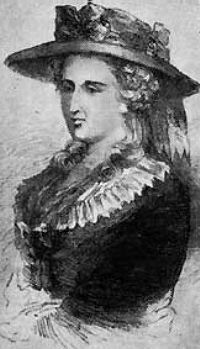 This entry was posted in Ann Radcliffe (1764-1823), Gothic and tagged 18th century, ann radcliffe, british, download, ebook, eighteenth century, epub, free, free ebooks, full text, Gothic, gothic novel, italian, kindle, literature, Matthew Lewis, pdf, Radcliffe, text on June 11, 2014 by stylesofdying.